Add a little togetherness at a campsite or picnic. The fabric of this 2-person hammock is cotton-cloud soft, with enough stretch to banish pressure points. Seam-free construction guarantees you won’t nap on bumpy ridges or wake up with stitchline face. Made of soft ripstop polyester that stretches and dries fast. One-piece design increases comfort and durability. Integrated stuff sack doubles as a pocket that fits tablets, eReaders or books. Webbing loop and carabiner at each. Optional hanging kit and a mesh bug cover are available separately. 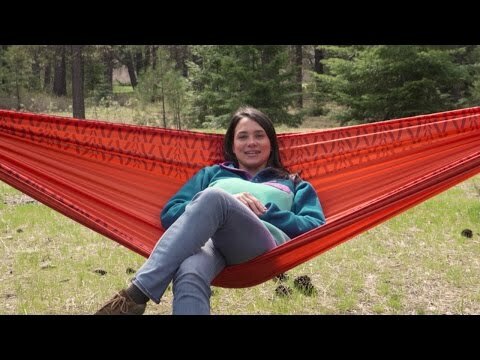 All components and accessories that are included with the hammock or are sold separately.